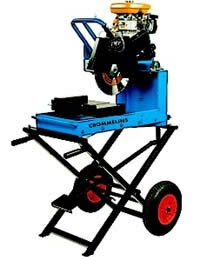 High performance industrial bricksaw with 360mm (14") blade capacity. Comes complete with folding stand with foot pedal control, carry handles and wheel kit. Features spring loaded cutting head with various blade settings. Electric model features 2.0hp electric motor, single phase. Petrol model is powered by motor powered by SUBARU EX17D 6.0 hp engine. Weighs approximately 70kg without stand, 95kg with stand.